The Many Flavors of FOMO – Love. Life. Practice. I occasionally feel that I might be using too much jargon here on the blog; it’s too easy to pick out the meme-of-the-day and write a post that is nothing but another in a long series of banal rehashings of each other’s content and Power Quotes. But FOMO – the Fear of Missing Out – is now in the Oxford English Dictionary, and it doesn’t get much more real than that. The ancestor of FOMO, “Keeping Up With the Joneses”, never made it that far, and one thing that the many articles I read on the subject agreed on was that the Information Age is the perfect environment for FOMO to run rampant. Where we used to only worry about the Jones next door, now we see into the intimate details of Joneses all over the world. My own particular brush with FOMO came this last weekend as Natasha and I were at yet another conference. We were busy; she was assisting me with my classes, teaching two classes of her own as well as giving an IGNITE-style talk. Meanwhile, I was hosting that evening as well as a short Open Space and also teaching four of my own classes (and assisting Natasha in one of hers). It was immensely rewarding; I was so proud of my partner as she touched people with her heartfelt and authentic talk, and loved hearing Open Space participants tell how they’d made new connections and mutual discoveries. But it hit both of us like a truck; we found, after classes, that we didn’t have enough energy to do much more than nap or, at best, sit outside with friends and talk. Sounds great, right? But at the same time the conference had opened up space in the evening for the 700+ attendees to play with movement forms and create together, and that’s where the FOMO came in. I should be out there, I found myself thinking. I’m not taking advantage of this chance to move with other people, to express my own passion and creativity, to have fun… Then a healthy dose of Imposter Syndrome kicked in: They’re going to stop inviting me to teach if I don’t actually do the stuff that I teach. And finally there was a good old fashioned guilt trip: You don’t get to go to these conferences with Natasha terribly often. She thinks that when you go, you’re off dancing with everybody, and yet you’ve only danced with her twice. You’re a Bad Boyfriend! Get that? FOMO was using someone else’s FOMO to make me anxious, and all of that was without the benefit of any social media at all. Meanwhile, all those things that I was doing – the presenting, the special events, the speaking? The things that were making me too tired? They were things that most of the people there envied, wishing they could live the “glamorous life” they imagined I live. Here’s the truth: if they experienced the reality of eating ramen in the hotel room and sleeping on airport floors in between delayed flights, they might not envy it quite as much. But at the same time, it is a glamorous life, filled with opportunity and joy. 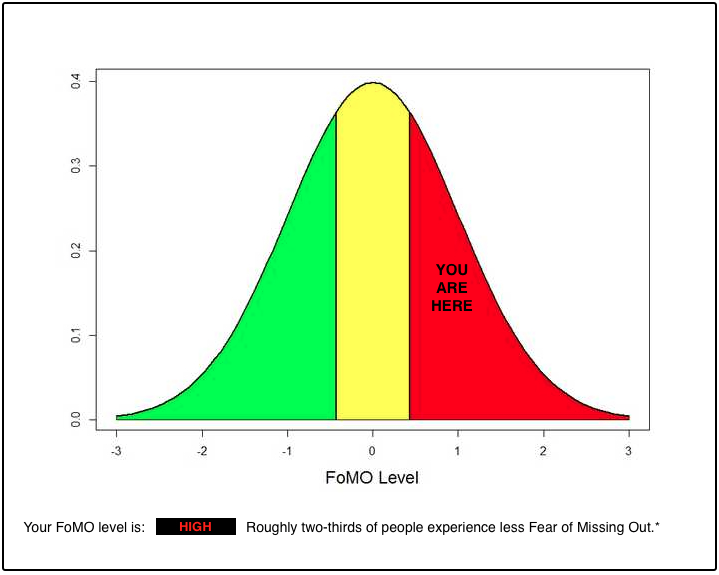 I would take that a step further and add that there’s an insidious form of FOMO that is more like FOHMO: Fear of Having Missed Out. On my kids, on job opportunities, on romantic relationships, on status updates, on last-minute sales. Especially that last: I’m exploring the idea of offering a webinar version of my Defining Moment project, and all of the guides for setting up a webinar insist that you have to set up an artificially scarce system: Act within the next five minutes or lose this opportunity! Enrollment only open for the next three days! Only fourteen spots left before this enrollment ends! Ok, so that last one might make some sense, but I as much as I dislike the pressurized sales technique, what I hate worse is that it works. People seem to need that pressure to buy, whether the product is worth it or not. Yes, that’s what I said. There are lots of solutions offered for countering FOMO; the links I’ve put up above are from excellent articles, and there’s also things targeted at both women and men in particular (guess which one has the ironic link to figuring out how your FOMO measures up to others?). If it be now, ’tis not to come. If it be not to come, it will be now. If it be not now, yet it will come—the readiness is all. Since no man of aught he leaves knows, what is ’t to leave betimes?